Students perform a squash of a termite and prepare a wetmount to observe the protist Trichonympha, which resides in the gut of the termite, where it breaks down cellulose. 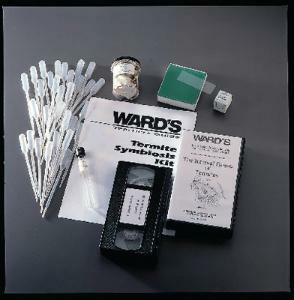 The kit includes termites and WARD’S Internal Guest of Termites video which demonstrates how to prepare the wetmount. Note: Coupon included for perishable materials. Redeem by phone or e-mail. Some states may require a USDA permit. Ordering information: No reproductive termites are sent with the culture. We do not send queens.